Off to Budapest, the Pearl of the Danube, also known as the Paris of the East. While it’s hard to decide what to skip, the spring edition gives an idea, which sights to visit as well as the events not to be missed in the beautiful Hungarian capital. Participating in workshops, watching breathtaking shows and listening or dancing to the greatest songs, you may want to know something more about our stars. To gahter some background information, we were talking to Andrea & Silvia, the 3x Bachata World Champions as well as to DJ Fabrizio Zorro from Italy and wrapped up some of the topics for you. Short before celebrating New Year, we joined the 1st Salsafestival Düsseldorf – what an amazing premiere! Congratulations to the organizer and the team of the Salsafestival Münster and Düsseldorf! Last but not least, our DJs’ pages and the Event Manager to keep you up-to-date with the most important upcoming festivals – enjoy! 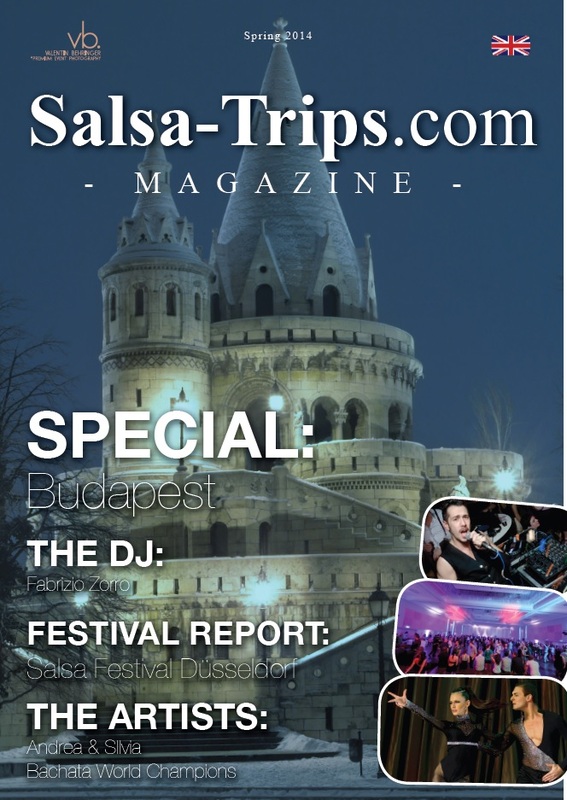 Please also recognize the ads of our partners, who are supporting the Salsa-Trips.com Magazine with their advertisements. We manage your Salsa Trips and you enjoy the party!